When I moved to Sheffield I decided to get involved with as much as possible to find out more about the city and the people. One of the first things I did, without realising how big and important the annual event is, was to sign up as a volunteer for Sheffield Doc/Fest. To point out how important the event is it included the premier of a film from the Oscar award-winning director Martin Scorsese, who even appeared on Skype at the festival. 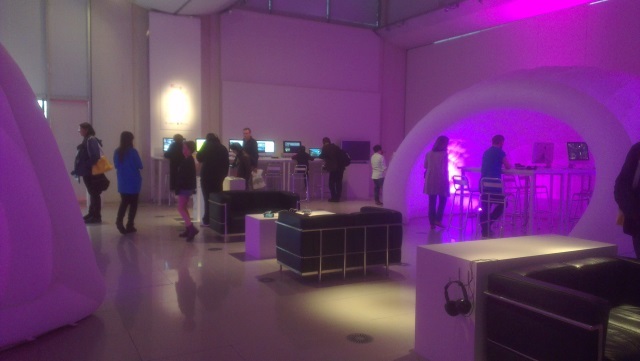 I worked in the interactive part of the festival which, from 7-12th of June, showcased interactive documentaries on computers and iPads as well as games and a story on the virtual reality headset Oculus Rift. 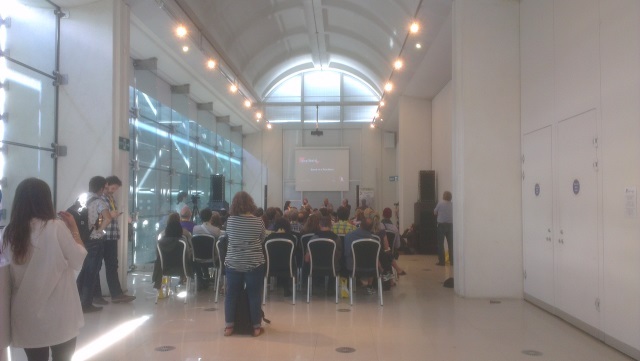 We were based in the Millennium Gallery in the centre of Sheffield, which was a lovely space to work in for the week, and were there to help people understand and show how things worked. My favourites in the exhibit where the two games, Type:Rider and Papers, Please. Type:Rider is a platformer game where you play as two little dots that teaches you the history of typography. In Papers, Please you work on border control and have strict rules about which people you can let in. You also have the opportunity to get bribes as you need more money to look after your family and pay the bills, but can get caught. In the ending I got I was dobbed in by my neighbour for taking a bribe and sent myself and my family to jail. On a few of the days we had sessions to organise as well, which included setting up the room and looking after the speakers and delegates. These were interesting as some of the talks were linked to the exhibits and you got to hear from the creators and learn a bit more about their pieces. Doc/Fest also has a number of notable people who attend to show their films, do talks or present at the festival at some point. It was good to see them get involved with the rest of the festival too. The comedian Jeremy Hardy came to some of the sessions we held, and I got quick chance to tell him that I love the News Quiz which he was lovely about. 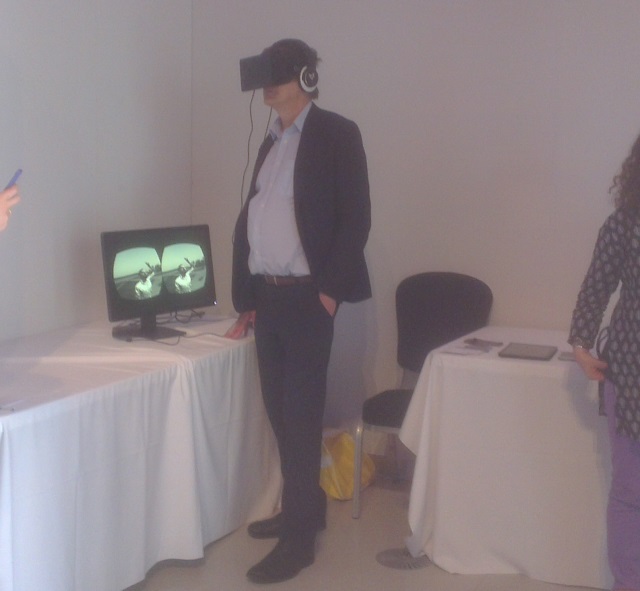 The greatest part of the week was seeing the editor of the Guardian Alan Rusbridger in our interactive section. He quite happily pottered around looking at the different exhibits and then he got a chance to experience the Oculus Rift. Naturally as he was tackling virtual reality we grabbed our cameras and snapped this frankly amazing but bizarre moment. I don’t know if I learnt these things or they were ideas that I had reinforced throughout the week but it definitely gave me something to think about — warning they may sound a bit clichéd. First of all always expect the unexpected. The interactive section was open to delegates and members of the public and we soon discovered that the Millennium Gallery was a popular place for school trips. 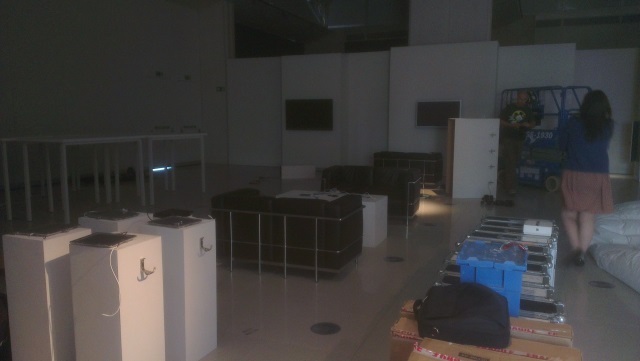 So on a couple of occasions we had to quickly get ourselves ready for lots of school children visiting our exhibit. It was excellent to see their interest in it, and also it was great because young children understand computers, games consoles and iPads better than anyone else. Also the questions that people have are always far more out there than you expect. This included in-depth conversations about the exhibits (some quick revision beforehand always helps) or just general questions. We fielded so many questions about toilets, wifi, the rest of Doc/Fest and where you can get passport style photographs done in Sheffield. This then leads me to my next point. Be honest and friendly. If you don’t know the answer to something don’t make something up, ask someone else who you think might know. It’s also just more fun if you are friendly when chatting to delegates, the public, other volunteers and staff members and try to learn names as well. Doc/Fest has a reputation of being the friendliest festival, and I think Sheffield as a city is pretty friendly too. It works the other way round too, be friendly to volunteers. These are the people who will help you out or know the people who can help you out. Also it makes the day more fun when you have silly chats. All delegates had to have their passes scanned when walking around the festival and one lady liked to think of herself as a grocery item each time she was scanned. So when we saw her we had to quickly think of new items to describe her, which varied from lemon curd to toothpaste. Overall it was a great week. I had no idea what to expect and I was pleasantly surprised. It’s reassuring to know that Sheffield is so friendly and inviting, I learnt a lot and I’ve got a few interesting stories to tell.